Black and White image of a Hewlett-Packard 17623A Interactive Graphics Tablet. A woman is seated in front of 2627A terminal. She has a pen in her right hand and is resting it on the tablet in front of the display. The keyboard is on her left. 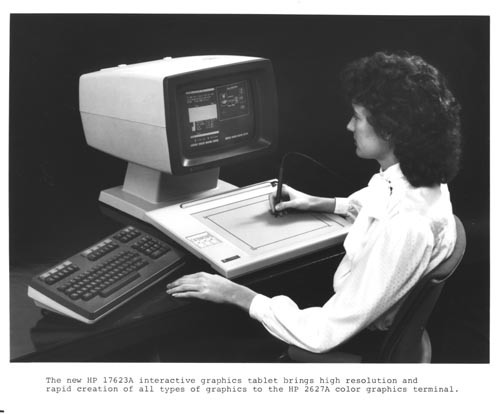 Legend bottom margin: " The new HP 17623A interactive graphics tablet brings high resolution and rapid creation of all types of graphics to the HP 2627A color graphics terminal.